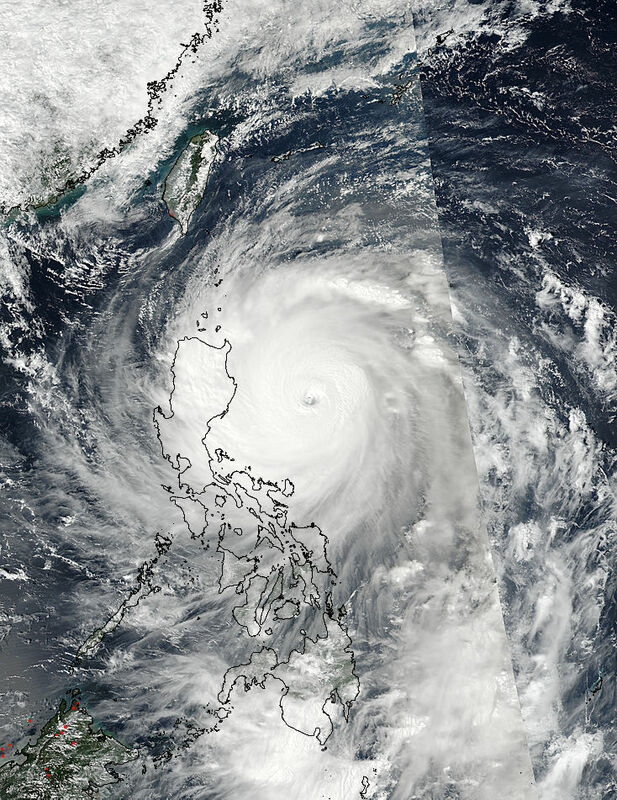 Typhoon Haima struck Philippines on Oct. 19, 2016. Typhoons (as they are called in the Western North Pacific), hurricanes (North Atlantic and Eastern North Pacific) and cyclones (everywhere else) are the same phenomenon: a tropical storm, fed energy by ocean warm waters which becomes catastrophic with winds over 117 km/h and up to 250 km/h, and an energy equivalent to several nuclear bombs per seconds. Ocean temperature over 26°C on the first 50 m is the key of a storm intensification into a cyclone – or not. Tropical Cyclone Heat Potential (TCHP) is a data computed either from ocean model, or from altimetry and in situ buoys, to map areas of possible intensification. 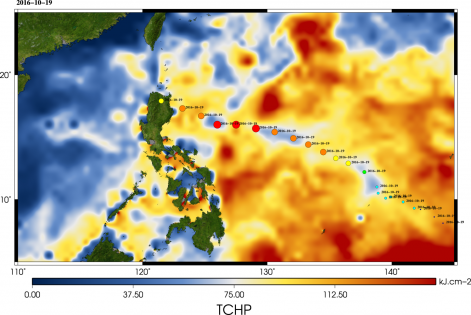 On Oct. 19, 2016, near Philippines, we observe in fact the reverse: the typhoon got a bit less intense after going over a patch of low heat potential. It thus struck Philippines not at a cat. 5 but 4 typhoon (which is still very dangerous).